This month I'm interviewing the one and only Samantha Clark, Regional Advisor for the Austin Chapter of SCBWI. I was delighted to get to know her better through her answers to my questions, and I know you will be, too. Where did you grow up, and did that place (or those places) shape your writing? If so, how? I grew up all over the world. I was born in South America, moved to England when I was 1, moved to Jamaica when I was 10 and the Cayman Islands when I was 12. When I was 16 I went back to England for boarding school, then when I was 20 I started university in Tampa, Florida. I had plans to move back to England after my degree, but a few months before I graduated, I met my amazing husband and all my plans went out the window. I'm sure my international background has colored my writing (for one it's still strange for me to spell color without a u and I can't get into my character's head if he or she uses the word Mom instead of Mum), but to be honest I'm not sure how it has affected my writing compared to a writer who has lived in one place their whole life. I know that all my moving taught me how very small the world is and how similar people are no matter where you go in the world. I found friends, bullies, insecurities, kindnesses, and everything in between in England, Cayman, Jamaica and the U.S. I was also often the new kid, and since I was already pretty shy, I got used to hanging back and observing the other kids before I made friends. Through that, I learned a lot about people and how they think. I learned that what they say and how they act is often very different from how they feel, and that the way they think often colors the truth. I know I have used that in my stories. 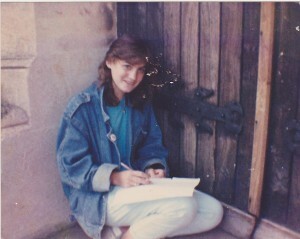 Samantha as a teen, writing stories. I'm not sure if I always wanted to be a writer, but I always wanted to be a storyteller. I told stories to our neighbors and my family when I was very young. I even had my own neighborhood newspaper. 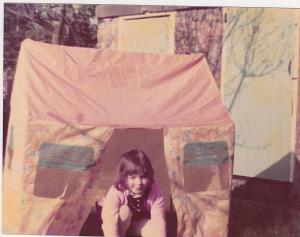 When I was a child, I loved telling stories through writing and theater and wanted to do either or both. But along the way, my path took a few detours. I was encouraged to study more practical subjects, and ended up doing a degree in journalism, although I did add a second degree of Theater Arts for me. Still, I started my first novel when I was in college, and when my husband and I moved to Los Angeles, I studied screenplays (when in Rome) until I finally realized that prose is what I enjoy the most. But utimately, my first love is story. A lot of computer time! I try to keep up an aggressive schedule of writing and/or revising for about half of every day, including an hour or two on my treadmill. Plus I weave in time to keep up with SCBWI tasks. I've got lots of plans and not enough hours to do it all. As I work from home, I also find time to walk our dog, keep the house clean, do laundry (I've got a load in the washer and another in the dryer as I type this), cook, hit the gym a couple of hours a week and spend some time with my husband in the evenings. Nowadays, I can usually be found working on my book in the middle of the night too. Any one 24-hour period is different from another, but all of these tasks are shuffled in and out every day, with writing my one constant. Hmm. That's a really good question. I think because I've got so much on my plate, I've really come to value and defend my writing time. As much as possible, I try to put writing before anything else, so I schedule my writing for the morning after I've checked emails. But when I've got meetings that have to be done in the mornings or SCBWI tasks that need to get done immediately, my writing is constantly on my mind and I have to find a way to carve out time later to get it done. Tell us about some of your accomplishments that make you proud (writing and/or otherwise). Hmm. Another difficult question to answer. I feel like everything that I'm most proud of in my life can't be attributed just to me. I am proud of a children's travel book I published in the Cayman Islands for charity, which is about to go to a third printing and has raised money to help kids on the islands. But a lot of the success of the book goes to the tireless work of the people who got it into stores and into the hands of kids. 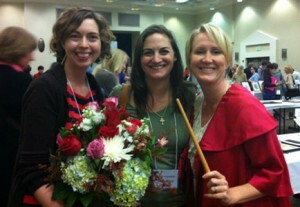 Amy Farrier, Samantha Clark and Shelley Ann Jackson, a few of the friends that help Samantha do amazing things. I'm also very proud of the Austin SCBWI conference this year and the new initiatives the chapter's starting, including these monthly member interviews (thank you Meredith) and our series of craft webinars, the first of which features the wonderful Darcy Pattison on building great characters. But again, so much of the success of these goes to the work of the rest of the regional leadership team (thank you Shelley Ann Jackson and Amy Farrier) and all our wonderful volunteers. How emotional it is. How rewarding it is. How challenging it is. How much I'm just a typewriter for my characters in my first draft then a disciplinarian to them in my revisions. And how much I need it. If I'm not writing, I'm not truly happy. Your writing is like a gift for your readers. When they open it, what do you hope they find? Ah, an easy question! 🙂 My hope is always that readers will find a good story, first and foremost, with characters they'll enjoy being with and action they'll remember long after they've finished. I also hope they'll feel (and I bolded that one because it's important). It doesn't matter so much what they feel; every story will affect readers differently, but I hope they feel something, whether it's joy, intrigue, sadness, grief, accomplishment, and that they feel along with the characters and take the characters' journeys to help them in their own lives. Those are my hopes. Samantha at age 4, with a head filled with stories. 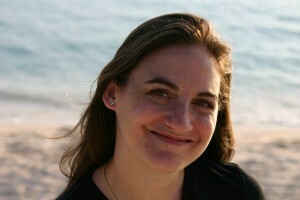 Author Bio: Samantha Clark was a journalist and editor for 20 years. Her nonfiction work has been published in Photography magazine and The Tampa Tribune, among others, and her short fiction has been published on Hunger Mountain, the literary Magazine of the Vermont College of Fine Arts. Samantha now concentrates on middle grade and young adult novels and won the Joan Lowery Nixon Award at the Houston SCBWI conference in 2012.